The simple, contemporary design of this stunning full over full bunk bed accentuates its sturdy metal construction, creating its gorgeous modern style. It features slat headboards and footboards and includes a matching ladder and side rails for the top bunk. This makes it a safe, comfortable, and beautiful bunk bed option. Give your children's bedroom a clutter-reducing and space-saving addition with any of the wonderful bunk beds in this collection. Their metal construction is sturdy and durable. The elegant designs found in this collection are beautified with a variety of different finish color choices, allowing you to find the bed that best fits a bedrooms decor. 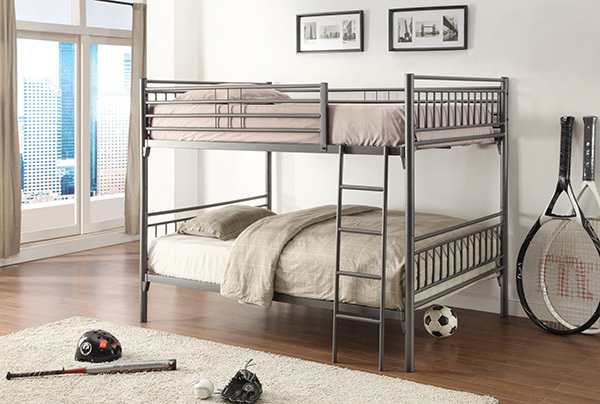 Comfortable and stylish, these bunk bed's are perfect for any child's room. Full size mattresses from only $69.